Good afternoon! 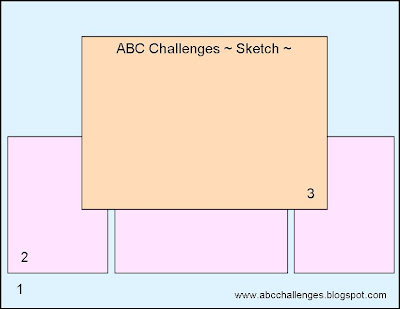 Today is Monday and that means it's time for another challenge over at ABC Challenges. 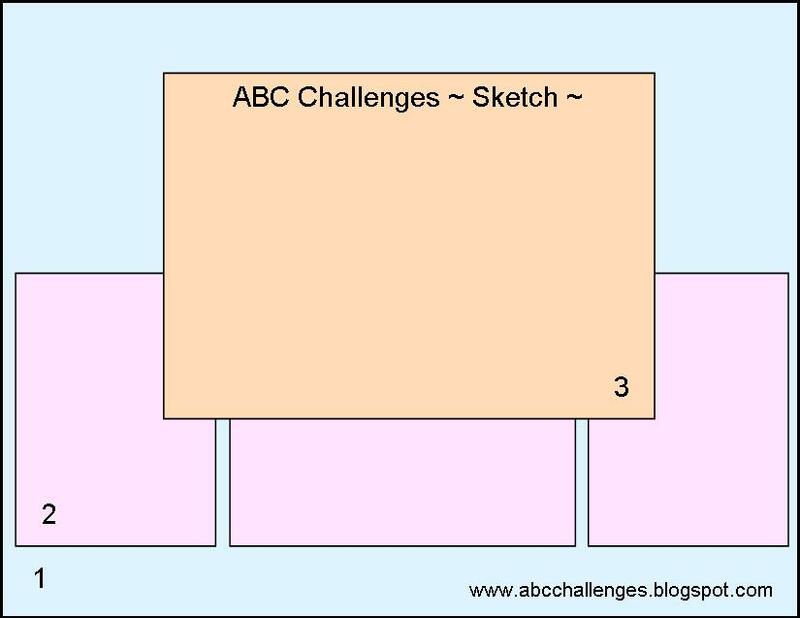 This week's challenge found here, is a sketch challenge and I tried to keep the sketch fairly simple. I added a few layers to my card, but this would be a great sketch for clean & simple cards too! Below I have a photo of the sketch posted. I ended up turning the sketch and I used dsp for the three panels. The background behind the owl is sponged using bashful blue ink and a punched out scallop oval to help create to clouds. 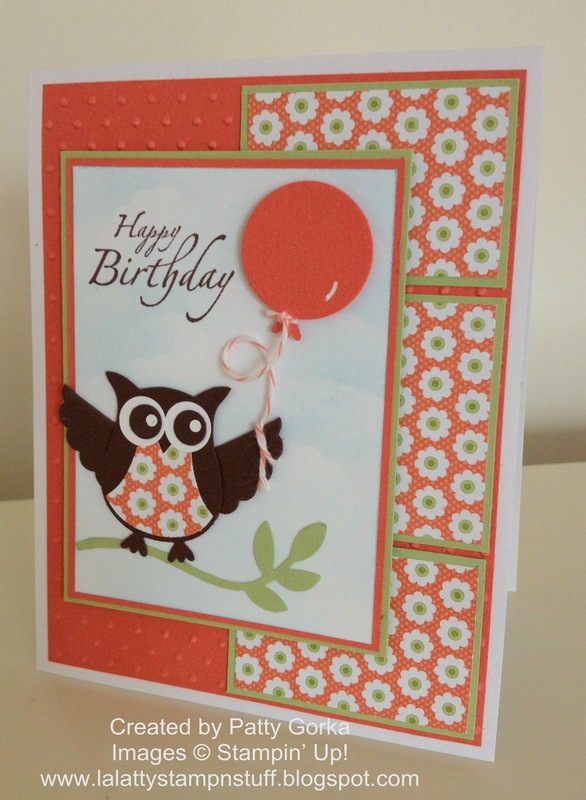 My coral background was dry embossed using the perfect polka dots embossing folder. I used the owl punch to create the owl and the scallop oval punch for the wings. To make the wings simply fold an oval punch in half long ways and then using scissors cut it down the middle and you will have two wings. The bird punch was used for the tree branch and I used a 1" circle punch to make the balloon as well as the owl punch again to create the bottom portion of the balloon. It's hard to see in my photo, but the owl's foot is actually the bottom (gathered portion) of the balloon. I tied some twine around the bottom part of the balloon and the other end is tied around the owl's wing. Thanks you for stopping by and I hope you enjoy the rest of your day. Please help spread the word about our new challenge blog. We are just starting out and it would be great to have you join us and play along! Patty, I don't mind at all that you CASEd the card, I'm always happy if someone is inspired by a card I've posted to my blog! In fact I'm honoured you wanted to CASE one of my cards, I'd love to CASE oodles of yours LOL! Anyway, your card is adorable, I love how the owl's vest is made with the same DSP you used for the panels! That is a wonderful sketch, I'll play along if I can this week! This is so cute!! I'm going to try to play along this week. Crossing my fingers! Patty, this is such a cute card. I love the paper. Those flowers are so nice!!! I love how cute his chest looks with the DP!!! Congratulations on the Featured Stamper!! !